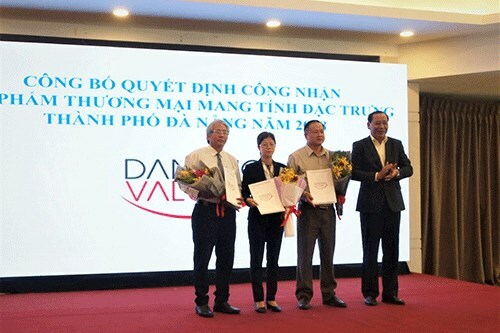 Da Nang (VNA) – The central city of Da Nang has awarded the “Da Nang Value 2018” certificate to six locally-made products in a move to encourage the production of unique local goods serving tourists. The six products include Merriman-branded men’s shirts and pants with expandable waist band of the Hoa Tho garment company, the model of Rong (Dragon) bridge made by Le Quang Huy fine arts import-export company, and Huong Que-branded shoe insole of Huong Que company. Da Nang began to select typical tourism products in mid-2018 based on such criteria as their relevance to the city’s history, culture, landscape and relics, the use of local materials and Da Nang-related symbols. In order to be selected, products should also be produced in the city, or have at least 70 percent of their value generated from the city-based production. The “Da Nang Value 2018” certificate will be valid for five years. During the period, the products are allowed to use the certificate’s logo in advertisement. The products will be advertised free of charge on the portals of the city and municipal departments. Da Nang is a popular sea tourism destination in central Vietnam. The city welcomed 7.66 million holidaymakers in 2018, up 15.5 percent over the previous year, including 2.87 million international tourists, a yearly rise of 23.3 percent. The total revenue collected from tourism activities was estimated at 24 trillion VND, an annual increase of 23.3 percent.